I hope so, Kelda. We'll find out tonight, I guess. Ok, we didn't find out who Daryl was with. We did get the story of where Beth was, and we did get to see her being a bit resourceful. Nice to see her picking up the scissors in a second bid for freedom, and figuring out that the doctor had her kill the patient that was another doctor, so he would be needed. Was glad when the creepy cop got his......death by zombie. Now, the twist of Carol being wheeled in......was she "save-napped" like they did to Beth (a term they coined on The Talking Dead), or did she let herself get "save-napped" in an effort to find Beth. This means (to me) that Daryl is not far off. Could this be from the hospital? Hmmmm........I wonder if Carol will be sacrificing herself to save Beth. I didn't watch the whole TD this week, so I missed this discussion, and I came to this thread for the very purpose of discussing this possibility. I think Carol got herself save-napped on purpose, and that, yes, Daryl is lurking nearby. Otherwise, it would be too much of a coincidence, especially since Daryl and Carol had been following them. Nooooo!!! I hope not. Dramatically, I can see where the writers would think that would be a good twist. She was hinting that she was going to go off on her own anyway. This would let her go out a hero and save the writers from wondering whether to cut back to her now and then or have her meet back up with the group eventually or what. But Carol has become perhaps my second favorite character, so I hope not. The writers would be trading short-term drama for long-term interest, because so many of the remaining characters are less interesting. The other question is, when Daryl came back to the group and then beckoned someone hanging back in the woods to come on out, was that just the writers way of being suspenseful about who was back there, or is there something strange about the person back there that made them hesitate to just march out right behind Daryl? At the time, I assumed it was the latter. But I'm beginning to fear it's the former. Judging from the previews, looks like next week's action is going to shift to the group en route to Washington, so we may not be getting these answers right away. I've heard Carol is at least in TWD until at least episode 15 of this season (as she is noted in casting list for that episode or something), so unless they leave any return to the hospital I think not. Also, I think she's the replacement for the comic Andrea. In the comic, Andrea is *the* top dog woman - the female equivalent of Rick, and was never killed by the Governor and Carol has been dead for some time so the characterisation tables have turned it seems.. I hope you're right! I would love to have Carol around, she seems to be the most interesting character on the show for me. Tie for second between Daryl and Michonne. Oh, good! That sounds like a pretty reliable clue. I would say the same. I like Daryl better, but frankly until he comes out, or does something besides the usual, he's not that interesting as a personality. Same with Michonne -- likeable, but kind of flat in terms of character (except in flashback, when we saw a completely different version of Michonne pre-apocalypse). 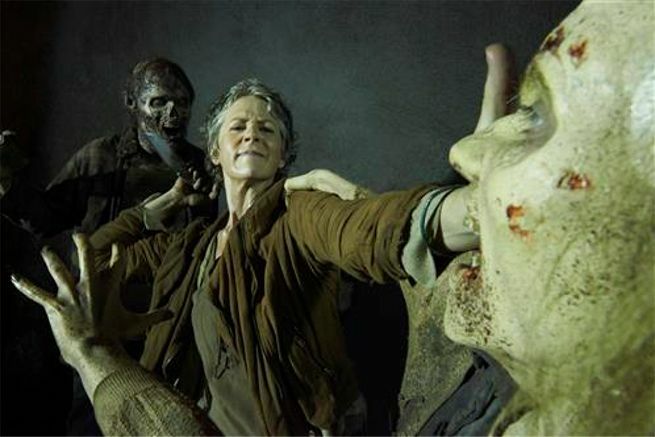 Carol has changed more over the course of the show, from meek abused wife to the group's biggest badass at the moment. Rick is somewhere just below them because at least he has some internal conflicts. The preacher I'll give the benefit of the doubt to because he just showed up. And then there's everybody else. Beth would probably have been at the bottom of the list. But it was nice to see her toughen up last week. Same with Michonne -- likeable, but kind of flat in terms of character (except in flashback, when we saw a completely different version of Michonne pre-apocalypse). Yes, I am hoping that as she gets closer to the group, she opens up a bit more. I liked seeing her open up to Carl when they were out and about in a few of the episodes. Looks like next week we have Carol and Daryl again....we'll find out how she got to the hospital. I don't know if I would say it was the worst ever, but it certianly wasn't one of my favorites. I will say, I never thought of killing zombies with a fire hose. How much pressure do those things pack?